I discovered Shangri-La, a Nepali and Indian Restaurant, at the Taste of Bethesda. Though opened in 2008, it went under new management in January 2016 and is named after the Nepalese paradise of Shangri-La with its stunning white peaks in the Kunlun mountains. From the outside, you’ll notice the front window frames of the modest spot are neon-lit with the orange and green colors of the Indian national flag. Inside the décor reveals framed pictures of life on the hillsides of Nepal, temple scenes, and the signature wooden windows of the old heritage houses in Nepal. On top of the cash register there sits a golden statue of Ganesha, the god of prosperity. Though small, the dining room can seat up to 60 people comfortably and can accommodate larger parties with some advance notice. General Manager Babu Subedi and Chef Singh Maharjan co-manage the restaurant. Babu Subedi, who received a BBA and a MBA in Hospitality, has been here since it opened. Prior to working at Shangri-la, he worked in European and Indian restaurants. Chef Singh Maharjan is from the Newari ethnic group in Nepal. With over 15 years of culinary experience, his passion for cooking was learned from his mother. 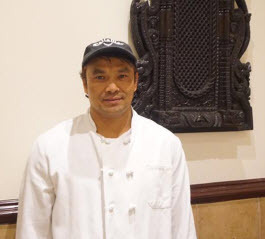 Prior to cooking at Shangri-la, Maharjan worked at Tandoori Nights from 2006 to 2015. 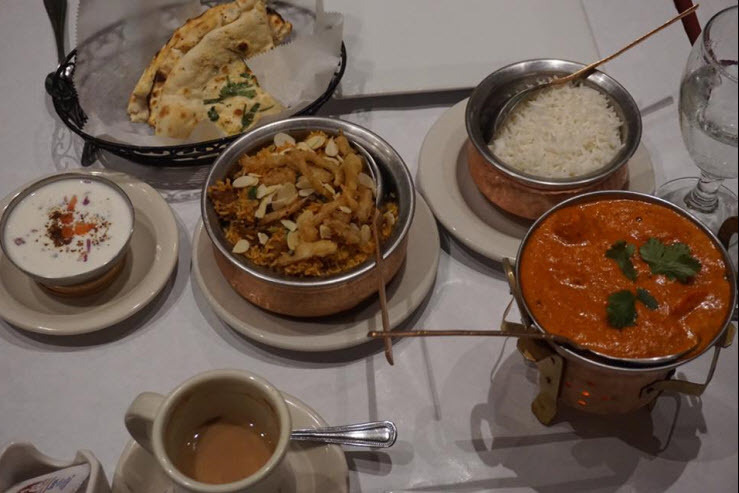 The menu is broken down into several categories: Appetizers, Soup, Salad, Specials, Thali, Seafood, Tandoori, Chicken, Rice/Biryanis, Lamb, Vegetable, Breads, Sides, Children’s Menu, Dessert, Tea/Coffee, Soft Drinks, and Wine. 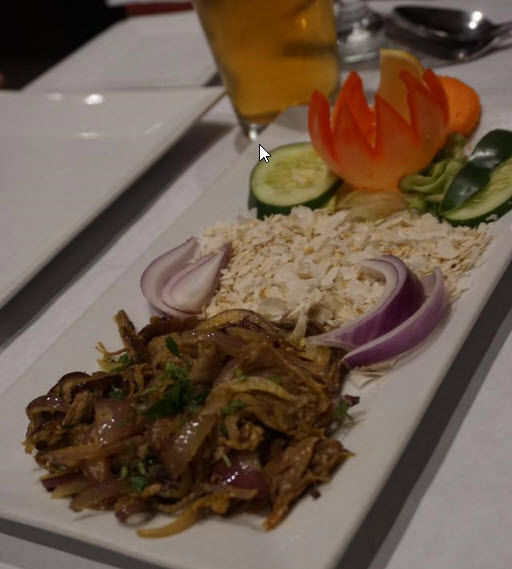 Each dish is made with high quality fresh ingredients, locally grown organic produce and blends of Nepalese and Indian spices. We started with drinks. 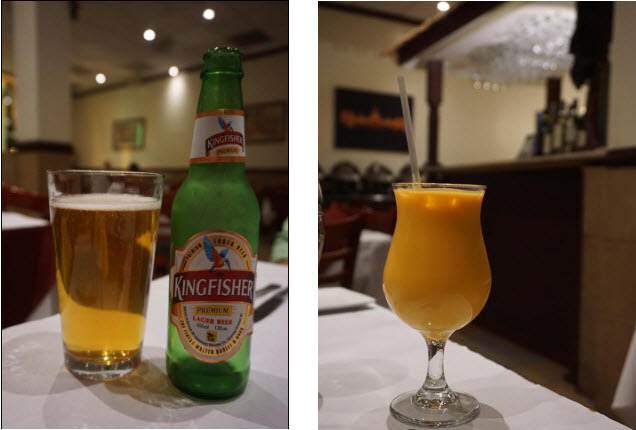 My friend ordered Kingfisher, the world’s number one selling Indian beer while I ordered the Masala Chai, a Darjeeling milk tea served with sweetener on the side, and Mango Lassi, a sweet yogurt drink with mango pulp. The Kingfisher tasted like a generic beer with a fuller body than an American lite beer and a hint of sweetness. The Masala Chai, served hot, has a sweet aroma and creamy texture. The Mango Lassi was semi-sweet, refreshing, and not too thick. We started our meal off with the Cho-E-La, a boneless duck marinated in a blend of ingredients that includes Nepalese herbs and spices. This dish was cooked with onions in a clay oven and served with beaten rice. It was good but bitter at times when you combined the meat with beaten rice. 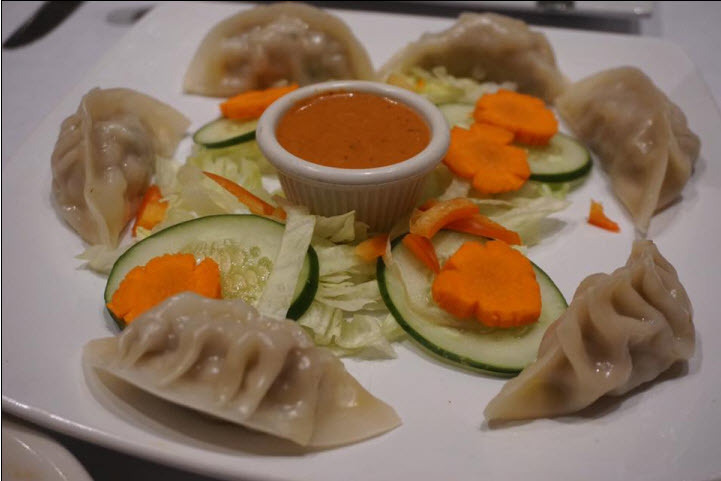 We also shared the Chicken Momos, steamed dumplings filled with minced chicken marinated with fresh ginger, garlic, and Nepali spices and paired with a mildly spicy tamater chutney. It was served with shredded lettuce, cucumber, carrots, and julienne of red bell pepper. The Chicken Momos had strong, sweet overtones of fenugreek. For entrees, I ordered the Butter Chicken – boneless white meat chicken prepared in a deliciously creamy tomato sauce. It was sweet and savory, and mild enough for people who don’t care for spicy food. In addition to the Butter Chicken, I ordered Garlic Naan, freshly baked white bread topped with garlic, butter and fresh herbs. It was salty and savory and paired nicely with the chicken. My friend ordered the Lamb Biryani, which consisted of lamb cooked to perfection and served with basmati rice richly flavored with saffron, nuts and raisins. The dish gave off a floral aroma and was served with Raita, a fresh yogurt sauce of cucumber, tomatoes, onions and herbs. When consuming the Lamb Biryani, the raita brings the heat of dish down. Unfortunately, we didn’t save any room for dessert. Overall, the service was very good and our meal was delicious, leaving us with the urge to return. 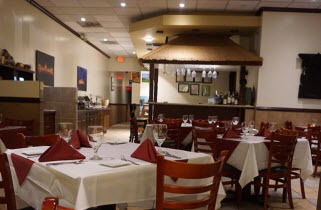 Shangri-La is located at 7345-A Wisconsin Avenue, Bethesda, MD 20814. Buffet style lunch is served on weekdays from 11:30am to 2:30pm, regular lunch on weekends from 11:30am to 2:30pm, and dinner daily from 5:00pm to 10:00pm.